We meet monthly, the 3rd Thursday, to share fishing information and to hear from professional biologists, guides and local experts on topics pertinent to the Olympic Peninsula. Recent topics have included: the Elwha damn removal, techniques for fishing for halibut and salmon, as well as, bottomfish/rockfish identification. We have a raffle at each meeting ($1.00 tickets) for fishing gear like lures, tools and rods. It's a great way to add to your tackle box and as everyone knows, "you can never have too much tackle". Current meeting details are on the Welcome page at the bottom. If you are interested in Great Places to Fish you can find photos taken by our members throughout this website and on the Fishing Reports page. Tap here to go to the club calendar to view upcoming meetings and topics as well as other events. 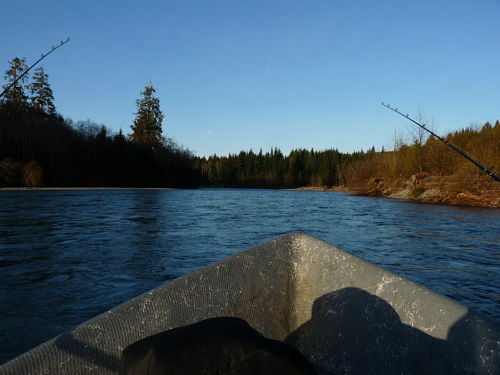 Great Places to Fish: The Hoh River from a drift boat.